No Bute The Original horse supplement is a Phenylbutazone-free dietary supplement, developed for the effective maintenance of healthy joints and connective tissue. Produced by one of the world's leading manufacturers of herbal equine supplements. No Bute is based on Devil's Claw. 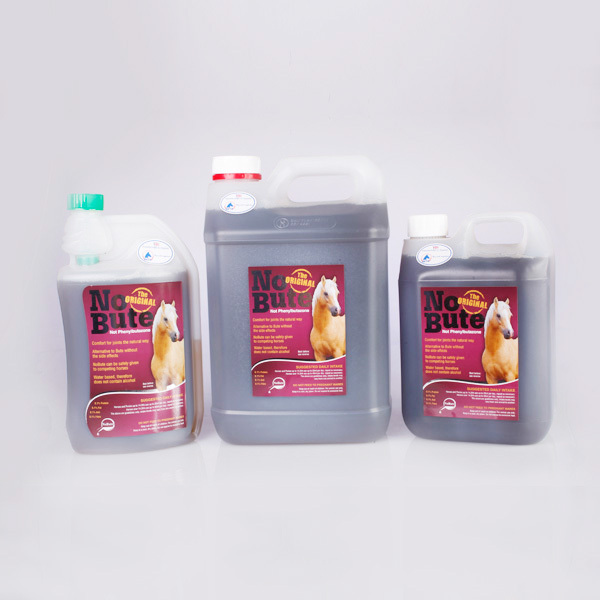 No Bute Premium has the addition of Glucosamine Sulphate, MSM and Vitamin C.
Below are some recent questions we've received regarding No Bute The Original Horse Supplement, including answers from our team. Can I compete affiliated using this product? This product is not suitable for use in competition. Can no bute premium still be used whilst competing? Can I use Devils claw and still compete? Mainly competing in endurance. At club level. Devil's Claw is now prohibited in all affiliated competition. Stallion and the difference in the standard and premium product. Hi There. Can this be fed to my stallion that is running with mares? He is 4 years old and in his first covering season. Yes, this product is perfectly safe for stallions. My pony is slightly lame. Would this work the same as bute? Devils claw (the ingredient in No Bute) is a nutraceutical thought to have some analgesic effect. Many people find it very effective for their horses. However a licensed drug such as bute which is clinically proven to have anti-inflammatory and analgesic effects in horses usually works better. How much would I need to give a 15h horse? Would I need to give this daily to get the best results and how much for a 15h 22 yr old cob? I would recommend 40mls every day for 2 weeks, then you can reduce the dose to 20 or 30mls per day after that. You can miss some days, especially after the first 2 weeks, but ideally you give some every day. No Bute does not contain any banned substances and so it is safe to use in competition. Is this safe for a mare in foal? Hello, my mare is currently in foal and on regular bute she has one sachet every other day so I am looking at taking her off this and using a substitute that is suitable for her whilst in foal. Is this a product you would deem safe for this instance please? Or is there any other products you have that you would feel more suited? She has the bute to prevent lameness from Ringbone. There is a general presumption against giving any medication (including herbal supplements) during the first third of pregnancy. This is a time when the developing foetus is particularly vulnerable and if possible all medications would be stopped at this time. If your mare is not too bad then I would suggest giving nothing at this time. After that, it might be that No Bute will be safer and adequately effective for your mare, so it is indeed a possibility. You should really discuss this with your own vet first though. None of the herbal treatments have been scientifically tested for safety during pregnancy to my knowledge, so we cannot be certain about them, but the well known ones like this have been so extensively used that they are probably safe enough. How long does it take for No Bute to ease stiff joints? If I use maintenance dose for 2 weeks then refrain from use, will I notice an immediate effect or does it stay in the body for any length of time? For most horses the improvement tends to be gradual and any decline is not immediate. I would say that this product generally appears to provide a mild help and is not as dramatic or potent as prescription medications, but all horses vary and some seem to show a better response than others. This product could be given to dogs, but it would be more sensible to use a product intended for dogs and this is what we would recommend. It is likely to be more cost effective to use something which is designed to help dogs rather than horses. Popular products these days are Yumove and Joint Force, but there are lots of others.